Auditioning mics to discover the model that’s best with a vocalist is time well spent and what handheld works for one singer may not work for another. Besides the sound of the capsule itself, other factors include how the polar pattern meshes with stage monitor placement and the mic’s on/off axis response — particularly important if your vocalist moves around a lot while singing. Once upon a time, bringing a wireless rig into the picture meant selecting from a few mic offerings from that manufacturer. Fortunately, a growing number of wireless companies now offer interchangeable capsule options in their higher-end systems. These can open the door for nearly endless combinations of mic/transmitter pairings, from the manufacturer itself and third-party suppliers. 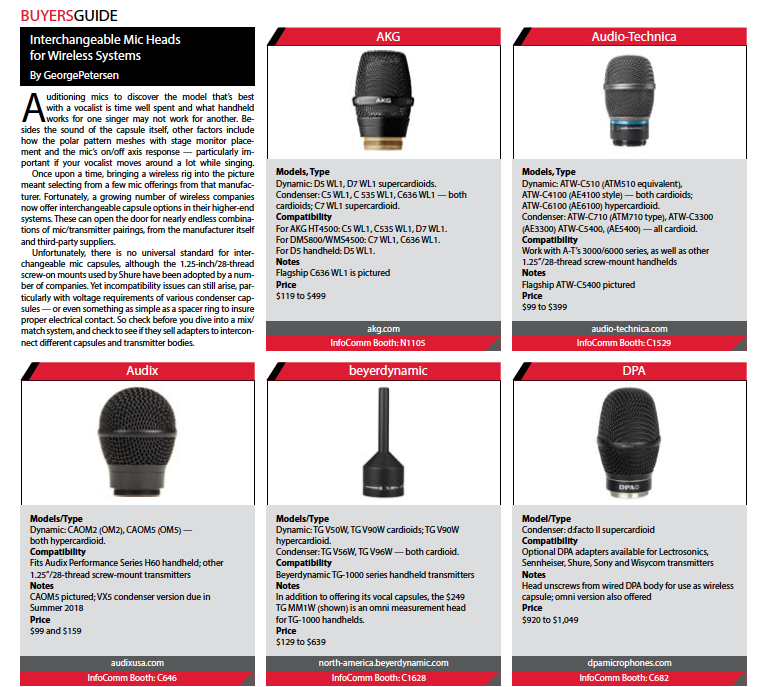 Unfortunately, there is no universal standard for interchangeable mic capsules, although the 1.25-inch/28-thread screw-on mounts used by Shure have been adopted by a number of companies. Yet incompatibility issues can still arise, particularly with voltage requirements of various condenser capsules — or even something as simple as a spacer ring to insure proper electrical contact. So check before you dive into a mix/match system, and check to see if they sell adapters to interconnect different capsules and transmitter bodies.